To study Mercury's magnetic field, researchers created 3-D computer simulations of the planet's interior and of the solar wind, the deluge of energetic particles from the sun that constantly bombards its nearest planet. However, the onrushing solar wind likely prevents that from happening, researchers said. The study found that the solar wind deflects charged particles in the shell around the planet known as a magnetosphere. The magnetic field of this magnetosphere reaches all the way to Mercury's core, limiting the strength of the field created by the planet's interior, researchers said. This schematic of the Mercury's magnetic field shows the magnetosphere and heavy plasma ion flux as seen by NASA's Messenger spacecraft orbiting the small planet. Messenger has been in a near-polar, highly eccentric orbit (dashed red line) since 18 March 2011. Maxima in heavy ion fluxes observed from orbit are indicated in light blue. "The magnetic coupling between the magnetosphere and the dynamo in the planetary interior yields a weakened dynamo that can explain the enigmatic weakness of the magnetic field of Mercury," said study lead author Daniel Heyner, a physicist at Technical University in Braunschweig, Germany. 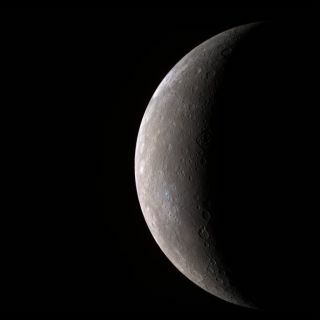 Scientists plan to test the accuracy of their models using data on Mercury's magnetic field and magnetosphere collected by MESSENGER and by the European BepiColombo mission due to launch in 2014, researchers said. "This is quite a challenge, as the magnetosphere is small and very dynamic," Heyner told SPACE.com. The growing number of alien planets that astronomers are discovering around distant stars may also offer insights into how planetary dynamos "are controlled by the stellar wind of stars that are in a different evolutionary phase compared to our sun," Heyner added. Heyner and his colleagues detail their findings in the Dec. 23 issue of the journal Science.